For this Premium Plus Collection we decided to design something completely different. 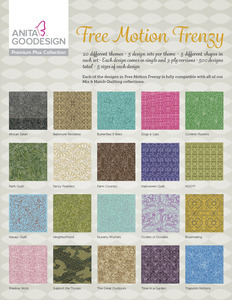 We carefully selected 20 of our favorite Mix and Match quilt collections and digitized free motion blocks to go with them using all new artwork. Everyone loves our free-motion digitizing, but the 20 themes we selected did not include any free-motion designs, so we decided to create them. 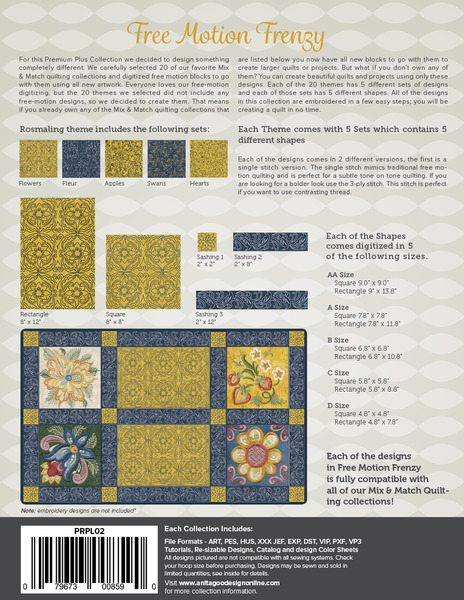 That means if you already own any of the Mix and Match collections that are listed below you now have all new blocks to go with them to create larger quilts or projects. But what of you don’t own any of them? You can create beautiful quilts and projects using only these designs. Each of the 20 themes has 5 different designs and each of those designs has 5 different shapes. All of the designs in this collection are embroidered in a few easy steps; you will be creating a quilt in no time. Each of the designs comes in 2 different versions, the first is a single stitch version. The single stitch mimics traditional free motion quilting and is perfect for a subtle tone on tone quilting. If you are looking for a bolder look use the 3-ply stitch. This stitch is perfect if you want to use contrasting thread.